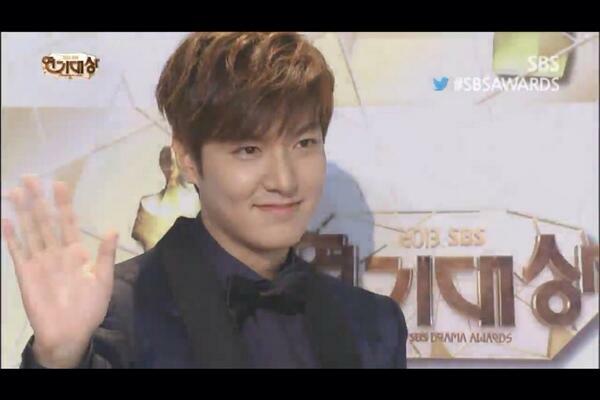 Drama viewers have spoken, and Lee Min Ho has won the ‘Popularity Award’ at the ‘2013 SBS Drama Awards‘! The actor also nabbed ‘Best Actor’ (‘High Excellence’) in a mid-length drama series. Congratulations to Lee Min Ho! Lee Min Ho and Park Shin Hye have been awarded ‘Best Couple’ for their chemistry in ‘Heirs‘ at the ‘2013 SBS Drama Awards‘! Congratulations to the lovely onscreen couple! Can’t believe this day came already! So excited! Results are great! Min Ho’s reaction while watching his own passionate kiss! Haha! 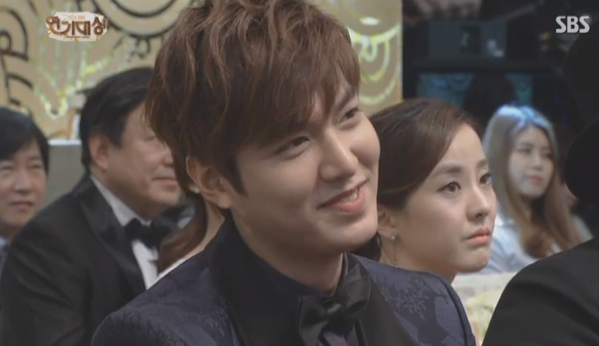 Shin Hye stole a glance at Lee Min Ho! OMG! 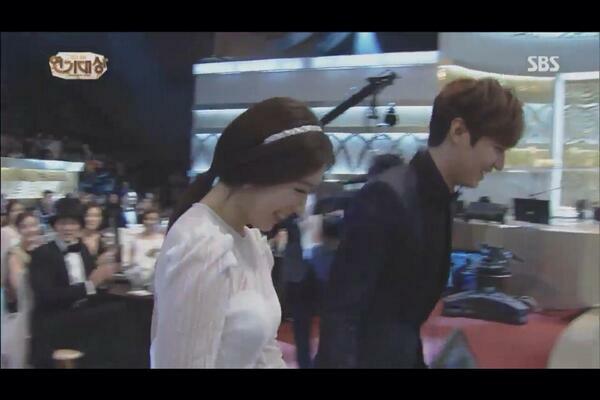 Park Shin Hye and Lee Min Ho won best couple! Holding hands to the stage, they look so happy! OMG, Minho’s reaction to the kiss scene! Lee Min Ho is still leading with 54,000+ votes! Fighting! 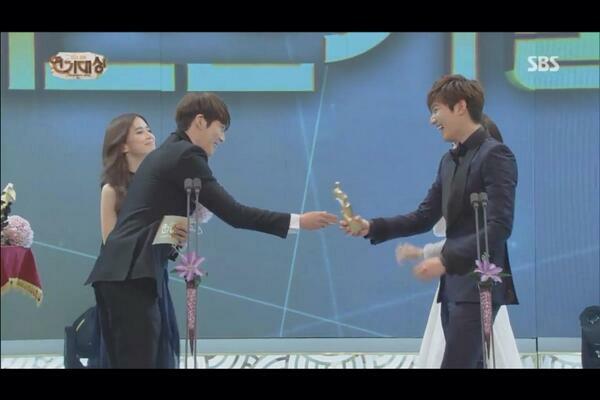 Top 10 awards: Min Ho, Woo Bin and Shin Hye are all there! When they gave it to Min Ho everyone screamed! They asked Shin Hye and Min Ho about the kiss again! They laughed! And they asked about the kiss again. Shin Hye is acting totally shy! 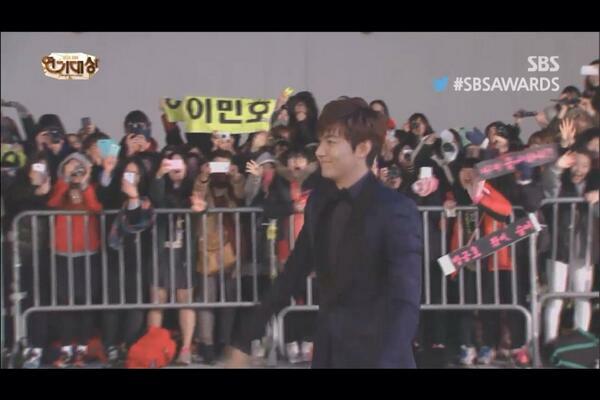 Lee Min Ho won popularity award! 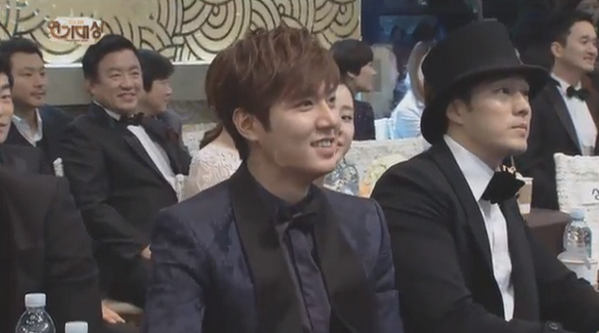 Min Ho’s and Shin Hye’s reaction to the drama! Yay! 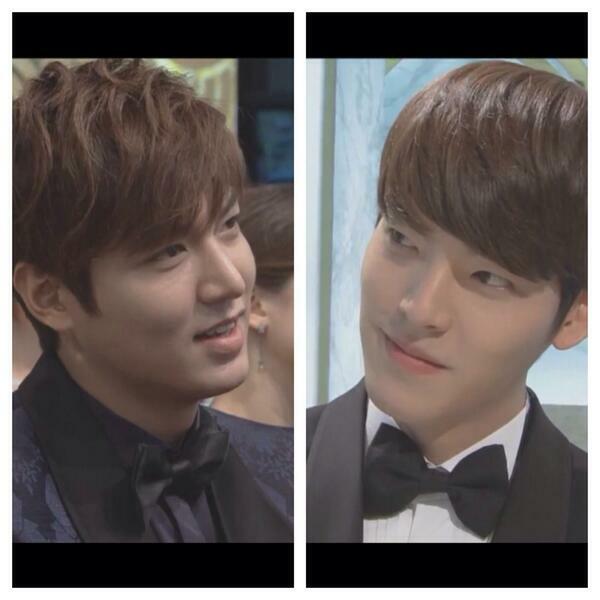 Min Ho and Woo Bin! So cute! 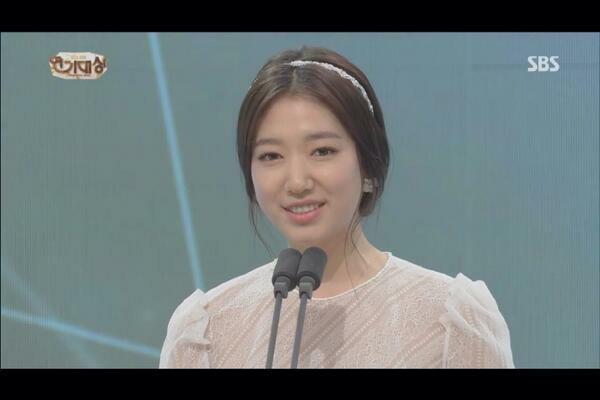 Park Shin Hye won and she’s crying! Lee Min Ho is touched! She thanked him saying “Our Min Ho oppa..” Aww! 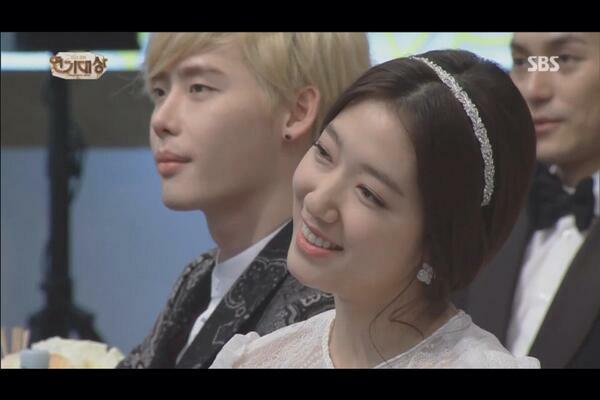 Park Shin Hye said she wore a wedding-like dress because of Tani! OMG! Min Ho is laughing so hard! Min Ho and Shin Hye hugged! 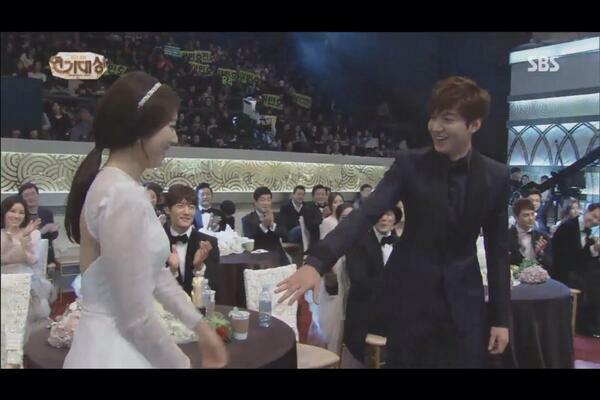 Min Ho and Shin Hye held hands! 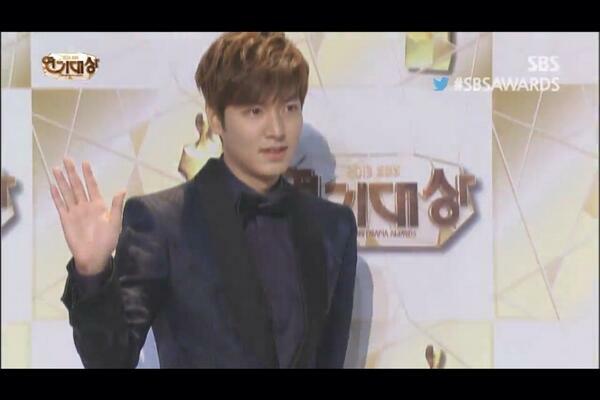 Lee Min Ho won Best Dressed Award! YAY! Love you so much, Min Ho oppa! Min Ho won another award! OMG! Thank you! 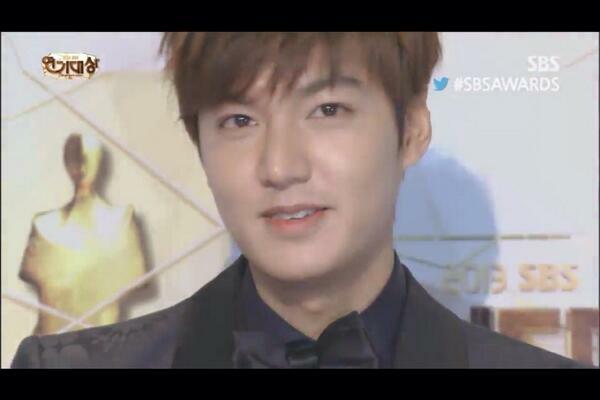 Please keep voting by tagging #SBSAWARDS and the name of Lee Min Ho on twitter! 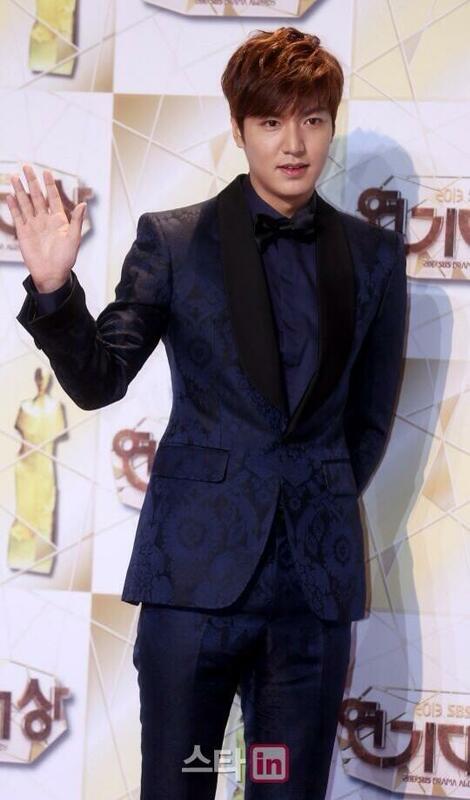 [OSEN=Park Jung Sun] The real Lee Min Ho when not on TV looked rather a little bit calmer than Kim Tan. Maybe it is because not long after SBS ‘He Who Wishes To Wear the Crown, Endure Its Weight – The Heirs’ (Also known as ‘The Inheritors’) is over, it was a calmness that looked like it had a little bit of fatigue also. Lee Min Ho, who is wearing a green knit sweater, left the drama ‘The Inheritors’ and looked like he is quietly saying bye and stepping away from Kim Tan. ‘The Inheritors’ had a high viewer rate of 25.6% (Nilson Korea, Nationwide basis) on its last episode that aired on December 12th and the drama ended. Not only the viewer rate in numbers, it also created various popular words and phrases and it obviously was a work that had a powerful ability to reach out and influence. And in the center, there was Lee Min Ho, who played the role of the main character Kim Tan. Started in fall and lasted until winter, Lee Min Ho spent two seasons with Kim Tan fever but he was calm and composed than expected. While looking at the snowfall on the day of the last shooting, he said that he thought ‘I think the snow is celebrating our end’. “Starting from the time after shooting the middle part of the drama, it was tough because of all the schedules. When the drama was over, the snow was falling and I thought that ‘The snow is celebrating our end’. (Park) Shin Hye cried a lot. For me, because I cried a lot in the drama, I did not cry on the last day of the shooting. The truth is, soon after we met Lee Min Ho, we asked about the kissing scene with Park Shin Hye. Different from our expectations that he is going to be shy about it, he smiled mischievously like a boy and he said he just did what is written on the script. Also, the journalist who asked the question and Lee Min Ho both admitted that the kiss was somewhat ‘Sexual’. “The kissing after taking off the apron was written as ‘Be sexual’ in the script. I also acted out the part thinking that what I am taking off is not an apron but something else (Smile). When I act, I am not someone who rehearses with an actress in advance. I only said that I am going to be intense when acting out the scene. I prefer an immediate response and interaction. The script sets the concept to ‘Be sexual’ and after that, the rest is all up to actors and actresses. The story about kiss continued. There were compliments given to him as ‘An actor who does good kisses’. He has taken the hearts of women viewers with his deep and romantic kiss in several of the works he was in. And the kiss that grabbed the hearts of women showed up few times in ‘The Inheritors’ also and it became the center of attention. 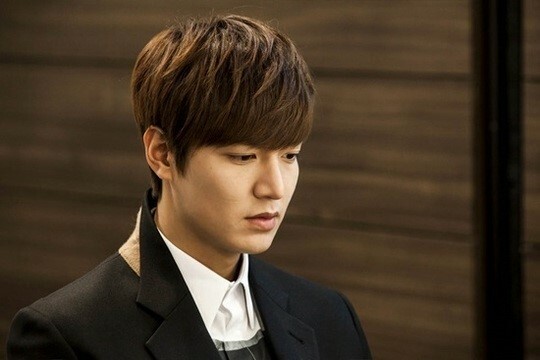 ‘The Inheritors’ is a work that is special to Lee Min Ho in two ways. One is working together for the first time with a writer Kim Eun Sook, who is an expert on romantic comedy. Another is that he wore the school uniform once more after KBS 2TV ‘Boys Over Flowers’. Lee Min Ho, who is going from mid-twenties to end of twenties, was a main character of unique and elaborate work with a theme of high school romance that the writer Kim Eun Sook is portraying. However, even when the drama had such an elaborate side, it stayed in the 2nd place in the viewing rate for several weeks because of its early competitor KBS 2TV ‘Secret’. It was a situation that was just too bad. “Back then, it was looked like the director and the producers not try to express it too much. It was same for me also. When the viewing rate exceeded 20%, the director said to me ‘Thank you for being devoted while not expressing what is on your mind’. The truth is, I see that the drama is becoming much more fun after every episode when looking it from the view of someone who is getting the script. I could feel reactions even when the drama ‘Secret’ is firmly keeping its place. Everyone did not worry too much. There was also one sorrow that ‘The Inheritors’ gave to Lee Min Ho. Other romantic comedies usually spotlights on the male main character in general. However, in contrast, in ‘The Inheritors’, the amount of attention that is similar to what Lee Min Ho got also went to Kim Woo Bin. So, we asked him directly about whether he was not sad. We talked more about Kim Woo Bin. Because for Kim Woo Bin, before and after ‘The Inheritors’ became clearly different. In just few months, he rose up as the hottest trend. He went from an actor who has a unique mask who was a model to the main figure of ‘Young Do sickness’. It was the gift that ‘The Inheritors’ left to Kim Woo Bin. This time, we switched the mood and asked him about feelings of acting as a high school student wearing a school uniform in the end of age twenties. 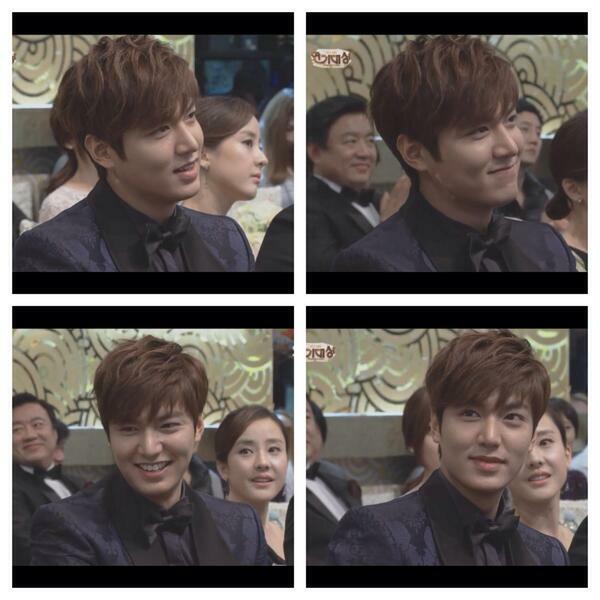 To the question that has a joke along with it, Lee Min Ho once again laughed like a boy. To this, he said “I felt very guilty” and mischievously confessed his mind. Just like what he said, even if he felt guilty, even if the school uniform might look awkward, what would be the reason Lee Min Ho chose to appear on ‘The Inheritors’? Lee Min Ho gave a romantic answer of because he wants to keep his characters of now forever. “I felt like my age is an age that is right in between the boy and a man. Before it is too late, I wished to keep my characteristics of now forever. There is an image that audiences want from me. I wanted to appear on school-based works and high-teen works by keeping the looks and my vibe of now forever and that is the reason how I came to appear on ‘The Inheritors’. 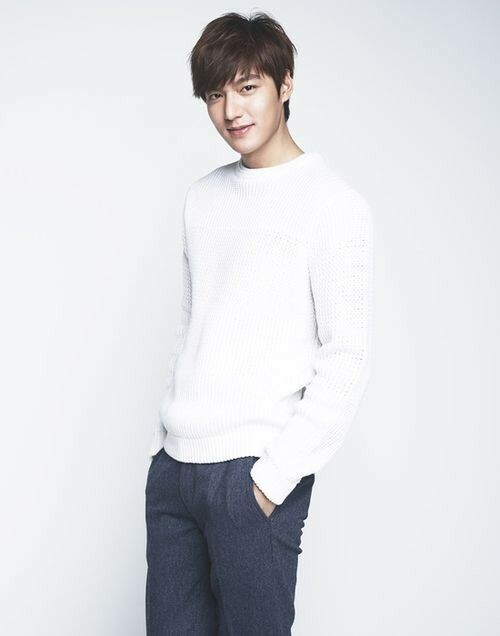 In addition, Kim Tan from ‘The Inheritors’ will come back as a wild man through the movie ‘Land gate, Gangnam 1970’. Lee Min Ho, who foretold his extraordinary transformation by going from romantic comedy to noir, put aside the characters of a boy and chose the beauty of man. We even asked him a rather hard-to-answer question. We asked what kind of award do you think you will get at the end of the year ceremony, Lee Min Ho once again showed the smile of a boy and Lee Min Ho answered “The most outstanding award?” in a manner pretending as if it is nothing.